Seeing the last Oprah Show last Friday was really mind-blowing. The time has finally come that Oprah is no longer on air, well at least on a public network. The last Final Re-runs, have finally run their corse. So what now, every one around the country has been trying to figure out what to do with this time slot. Even everyone’s’ Best Friend Gayle King, was sharing her thoughts on how to fill the time, that for 25 years belonged to the Queen of Talk. The Queen may be gone, but it only gives way for a charming Prince. Today, ANDERSON, will premiere, a show that deals and talks with ordinary people, sound familiar? That quote was really taken out of the 1st ever Oprah show Back in 1986. 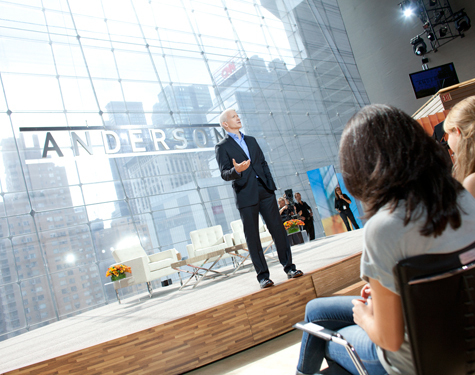 ANDERSON, the new show that everyone seems to think will re-define talk yet again. Of Course the multiple EMMY Awad winning journalist has an edge, we certainly didn’t catch Oprah flying to Afghanistan, or to the heart of the protest in Egpyt, and who can forget that coverage of Hurricane Katrina in 2005. Cleary this show, will deal with ordinary everyday people, but we all know the historic shows are on their way to the front line of The ANDERSON show. Mr. Cooper, earlier this year stated that many of his inspirations were among the greats in daytime talk, Phil Donahue, Geraldo Rivera, and of course Oprah Winfrey, he will clearly tap into all three, and give his own Anderson edge, that we have seen for years on his other show, Anderson Cooper 360 on CNN which, talk is that show will still go one, as hard news coverage, you know I do love his Ridiculist. All this anticipation for today’s premiere, is the reason it is on my Obsession list for the week. Barbara Walters, during the premiere of The View, stated “Now that Oprah is Gone, We know we will get everybody frist”, speaking of the guests Oprah always seemed to have snagged., Barbra clearly doesn’t see the pull, that Anderson has, such as todays pilot show, which will feature the Parent’s of Late Amy Winehouse. The ANDERSON Show, is clearly set to blow everyone out of the water in daytime talk, the show does have a few secret weapons, The crew and staff that will make up the ANDERSON show. (the new it media job), In fact Oprah may have sent a few referrals, three staff members of the ANDERSON team are straight from the Harpo Productions Family, including executive producer Lisa Morin. As a viewer who will painfully miss the Oprah Show, i feel so elated that ANDERSON is now the keeper of an iconic time slot in daytime talk, and the team behind ANDERSON will make for a smooth transition into a new obsessive show, im so excited to put this on my list , catch it today at 3pm on WFAA 8 Dallas. This entry was posted in | and tagged Amy Winehouse, ANDERSON, anderson cooper, CNN, Daytiime Talk, Harpo Productions, Oprah, Oprah Show, Talk Show. Bookmark the permalink.